I would imagine this Villa was very nice in its day but it's getting tired now and in need of an upgrade. It has quite a few issues that need addressing such as the shower rooms that are old and grubby especially the one adjacent to the third bedroom, we were also short of towels. Several lights were not working in various rooms. In the kitchen there was no grill pan or oven trays and only one oven shelf with a lack of ovenproof dishes limiting the use of the oven and grill, the dishwasher was in poor condition with wheels missing from the trays and holes in the baskets making it difficult to use, the patio doors were also in poor condition very insecure. The electrics left a lot to be desired you are asked not to use the washing machine and dishwasher at the same time as this will trip the electrics it turned out you couldn't use any two appliances at the same time as this would trip the electrics making it difficult to make a meal if you needed to use the oven and hob together which I tried to do. Showering was another problem as there was not an abundance of hot water you are asked to stagger showering so as not to use all the hot water at once, I was there with my son so it wasn't a major issue for us but I would imagine it being difficult for a party of four or six. The whole Villa needed a deep clean I can't comment on the air conditioning as we were there in December 18 and didn't need it. Another thing worth a mentioning. This villa is a good walk to the town center especially the hike back which is a steady uphill trek not recommended for any one with walking or mobility problems they would need to use taxis or have a car. Unfortunately for us the Villa next door was being renovated at the time we were there so we had hammering, banging, chiselling with angle grinders and jackhammers going from 8am to 5pm Monday to Friday with the odd truck and crane thrown in for good measure along with the obligatory whistling, singing and loud radio. How long this is going to go on for I don't know but it sounded like a big job. This holiday has several problems... Requires a deep clean. Pool should be cleaned on changeover day. Pool area dirty and littered with cigarette ends. Air condition not working due to causing electric shutdown. Regular electric shutdown. Unable to ascertain reason... Told overload reset. Having used Villa Plus before this is extremely poor accommodation. In need of major clean. Grubby !!! Rep appeared embarrassed when we called to complain. Cleaners appeared and spent 40 mins mopping floors. This property could be / should be exceptional... Similar to other villas on the resort. We are not sure but one of our party ended up in hospital with a unrinary tract/ kidney infection diagnosed after rushing her to Arrecife hospital... May be caused by ecoli. Advised to go to A&E immediately on return to UK. 4/5 days treatment required in children's unit Chester. 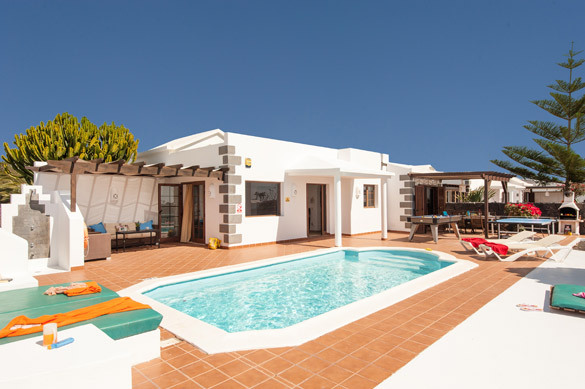 We believe strongly this holiday villa has been missold.